July the 4th is on its way. Our neighborhood started a parade for the little kids - they are so cute riding on their decorated bikes and wagons! I like to decorate my house with little pieces here and there and also put a couple of pieces in my office. This ornament is perfect for that! It hits all my sweet and cute requirements. 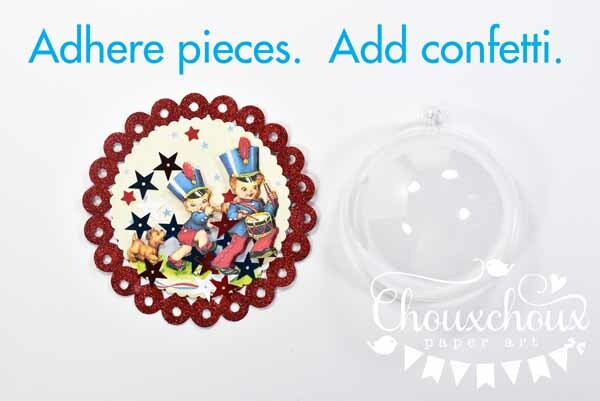 There are a lot of dies out there that will work for these plastic ornaments. 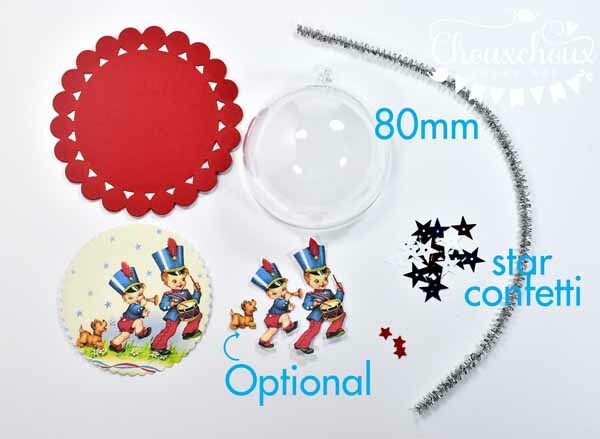 You may have a set of circle dies or scallop dies that would certainly work. I wasn't quite happy with this one and added some punched holes all the way around before I glittered it up. Next, just stack up the pieces, popping up the boys and dog if you wish. I glued three red mini stars in the background and added some metallic star confetti. Be sure to glue the ornament half with the open tab at the top so you can tie on the hanger. I used Aleene's - just running the glue along the bottom of the plastic ornament. I just can't do it neatly enough with hot glue. I wrapped the ornament with a silver chenille stem (actually it took a little bit of second one as well). For that I did use hot glue, but not all the way around, just at the top, each side and the bottom. For the decoration at the top, I glued on a couple of bows and then clipped on a further decorated clothespin. You can download the patriotic marching boys HERE. When you get to the image, wait just a moment and the download button will appear in the upper right corner. So glad you came by - have a wonderful week! Another adorable project. Love your neighborhood parade for/by the children. Wonderful way to instill a sense of patriotism in them. Oh, this is really cute!! 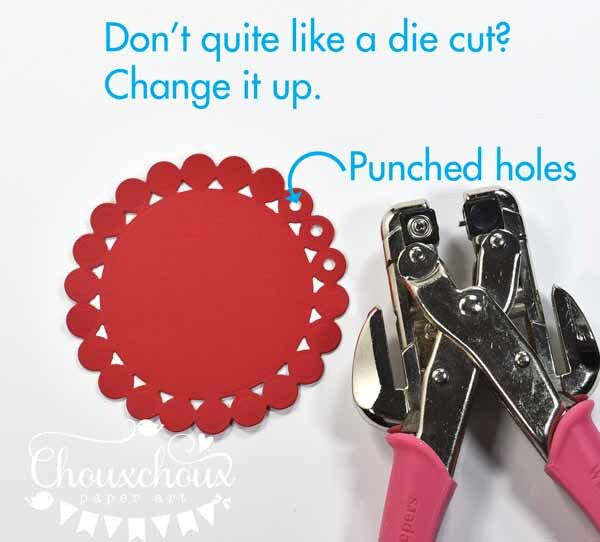 Adorable project and love the idea of "stretching" a circle die with punched holes, so clever! You are so creative, Lori--adorable ornament! Love the image, glitter & chenille! Adorable. What a super ornament - TFS the idea and the image. 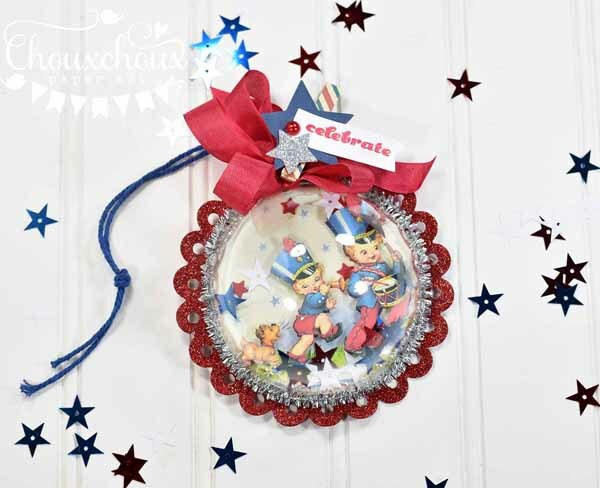 What a CUTE patriotic ornament, Lori! Love the adorable image and all the sweet touches with stars, chenille, and ribbon! Oh... awesome... I just LOVE that image!! 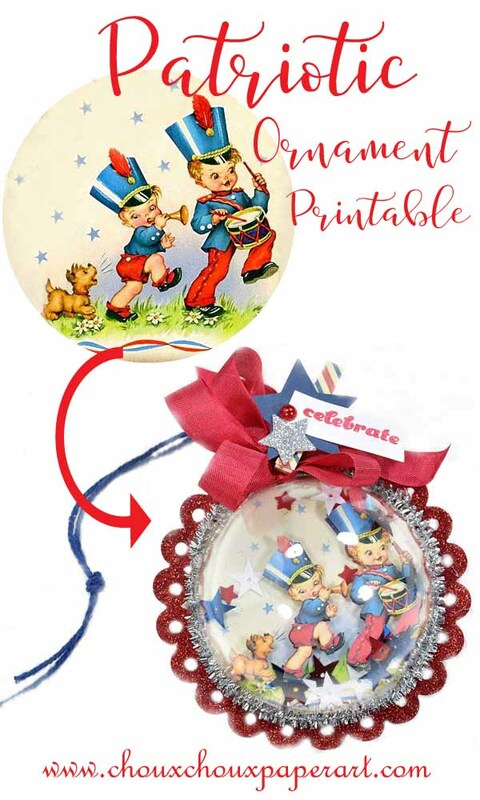 Such a beautiful ornament..and what a great idea to change the die cut by punching holes in it... may I add... your hole punching is perfect...lol.. So sweet - you always make my heart smile! Cute, cute ... CUTE, Lori!!! Really love this one! Hugs for sharing it with us! 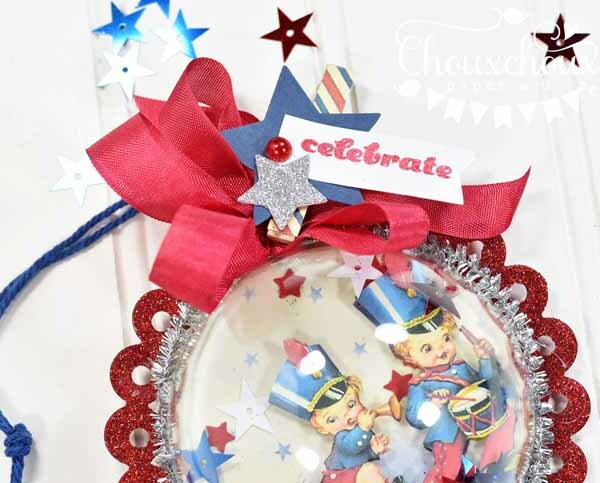 Awww this ornament is so cute, I love that fabulous patriotic image! That is so adorable and SO sweet! I love patriotic decor. I have some out all summer at my house. Love this idea! Thanks for sharing! This is so fun, Lori! What a clever idea to add the punched circles to your die cut. It really does add so much. And I love the glitter and chenille too! Fabulous ornament!! Oh, Lori, I always find such inspiration in the pages of your blog! This is BEAUTIFUL, and I love what you did with changing things up a bit with a simple punch, not to mention all those delicious trims! Yum! So so Sweet.....such a cute ornament Lori! I'm always inspired when I visit, you make the sweetest things. I love the way you photograph your projects, just wondering what camera do you use! Have a wonderful weekend!